In mid Febuary into early March; we were a group of 11. (10:1 women to men, ages 39->71yrs.). 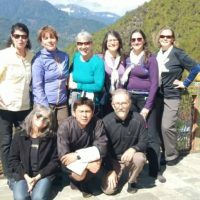 Along with 3 male guides from Wind Horse Tour and Trek. Some of us were picked up at the airport in Guwahati, by Yeshi. He saw us before we saw him! 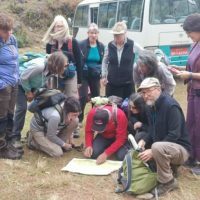 As a group, we all walked into Bhutan by way of Gelephu. What a stark difference between the chaos and pollution of India to the calm and relative clean of Bhutan. 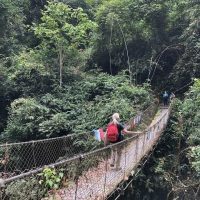 My favorite part of our adventure was the trek; although the rest of the trip was amazing and beautiful as well. 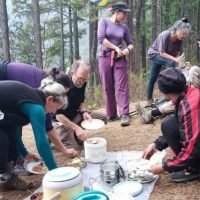 Our trekking crew from Wind Horse were kind, fun and gracious hosts.The meals on our trek were the best! Chili Cheese! Villagers from homes near places we were walking by; greeted us with local oranges and arra (local rice wine). Some would also be porters for our camping equipment, (bedrolls, tents, kitchen and seating). We would do a kind of walking leap frog with them on the trail. 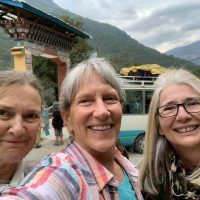 The hotels and restaurants, we visited along our way to Thimpu (and Tiger’s Nest! ), got progressively more populated. 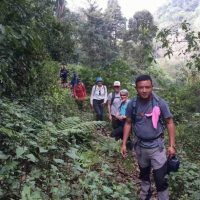 So by the time we got to Tiger’s Nest, I felt Our guides- Pema Dendup and Yeshi Penjor, as well as our very skilled driver Gudu Mahat gently prepared us for our last big hike together. 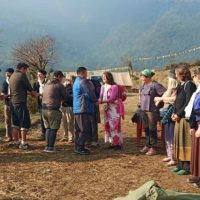 They absolutely made my experience of Bhutan! 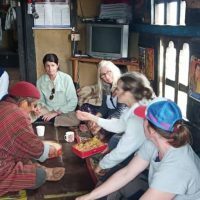 Knowledgeable and passionate about sharing in their home’s culture, rich history, hospitality and Yeti stories. They were playful and curious about each of us, as we were of them. Pema and Yeshi even learned how to make snow angels! 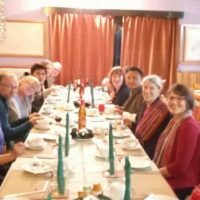 We stayed in Bhutan for 11 days. I have memories to last a life time and new stories to tell. 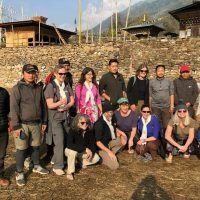 Wind Horse Trek, and our beloved guides absolutely made my experience a positive, life changing adventure. Thank you so very much!